The October 1917 revolution in Russia was recognised by friend and foe as a major historical event. It was clear that this was not just the overthrow of a government and a regime, but that an entire social order collapsed and out of its ruins something genuinely new was about to be constructed. The debates about the nature of the new social order and its origins have been with the revolutionary movement ever since and split it up into mutually hostile camps. What is the political basis for this hostility? As early as November 1918, while Lenin was in full command with Trotsky at his side and Stalin was hardly heard of, Rosa Luxemburg, a comrade-in-arms of the Bolsheviks, wrote a sympathetic but critical appraisal of the Bolshevik revolution. Her criticism contained an ominous warning on the possible consequences of Lenin’s restrictions on the authority, and freedom of expression, of the workers’ councils (soviets). “Without general elections, without unrestricted freedom of press and assembly, without a free struggle of opinion, life dies out in every public institution, becomes a mere semblance of life, in which only the bureaucracy remains as the active element. Public life gradually falls asleep, a few dozen party leaders of inexhaustible energy and boundless experience direct and rule. Among them, in reality only a dozen outstanding heads do the leading and an elite of the working class is invited from time to time to meetings where they are to applaud the speeches of the leaders, and to approve proposed resolutions unanimously – at bottom then, a clique affair – a dictatorship, to be sure, not the dictatorship of the proletariat, however, but only the dictatorship of a handful of politicians, that is, a dictatorship in the bourgeois sense, in the sense of the rule of the Jacobins (the postponement of the Soviet Congress from three-month periods to six-month period). The warnings of Rosa Luxemburg were ignored by most revolutionaries during the first years following the revolution. Even her own party in Germany did not publish them. This can be understood when one considers the tremendous enthusiasm for the first successful breach of the Bourgeois world. However, as the years passed, and the regime of the Bureaucracy in Russia produced unprecedented “brutalisations of public life”, Rosa Luxemburg’s warnings acquired a new significance. Already in the mid-1920’s and throughout the 1930’s many in the revolutionary left started a critical reappraisal of the Russian revolution, regime, and the relation between these two. One of those who attempted to answer these questions was Trotsky, whose role in the revolutions of 1905, and October 1917, makes him second only to Lenin. Trotsky produced many analyses of the new society that was taking shape under Stalin’s rule. Stalin did not merely establish the dictatorship of the Politburo and the Secret Police, but moulded an entire society to go with it. New property relations, new social roles, new motivations, new personality types, new authority relations, new legitimisations, new social classes and strata, new attitudes to production, life, sciences, arts. Whether one liked this society or not – it came into existence as an accomplished fact and had to be dealt with. In the new Russian society there was no private ownership of the means of production, no free market economy, and no profit motive, so that it could hardly qualify as “Capitalism”. However, since 99.9% of the population in that society had no influence on the political decision-making process and were reduced to the permanent status of an audience “invited from time to time to meetings where they are to applaud the speeches of the leaders and approve proposed resolutions unanimously” it was not what most revolutionaries understood as “Socialism”. The essence of Trotsky’s answer was that Russia was still a “Workers’ State” due to the fact that there was no private ownership of the means of production, but the Party’s apparatus (i.e. the full-time officials), though not a “class”, established itself as a cancerous “growth” on a basically healthy political system. The rule of the Bureaucracy was, said Trotsky, “a temporary relapse”. Trotsky’s answer calmed the gnawing doubts of many revolutionaries by invoking historical analogies: “just as it was too early to appraise the French Revolution and the post-revolutionary society during the period of Napoleon, so was it too early to appraise the Russian revolution and society during Stalin’s period”. How “temporary” must a social system be before it is recognised as a viable historical phenomenon? What conclusions must revolutionary socialists draw once they recognise the rule of the bureaucracy as a viable historical entity? “If this war provokes, as we firmly believe, a proletarian revolution, it must inevitably lead to the overthrow of the bureaucracy in the USSR and the regeneration of Soviet democracy on a far higher economic and cultural basis than in 1918. In that case the question as to whether the Stalinist bureaucracy was a ‘class’ or a growth on the workers’ state will be automatically solved. To every single person it will become clear that in the process of the development of the world revolution the Soviet bureaucracy was only an EPISODIC relapse. If, however, it is conceded that the present war will provoke not a revolution but a decline of the proletariat, then there remains another alternative: the further decay of monopoly capitalism, its further fusion with the state and the replacement of democracy where it still remained, by a totalitarian regime. The inability of the proletariat to take into its hands the leadership of society could actually lead under these conditions to the growth of a new exploiting class from the Bonapartist fascist bureaucracy. This would be, according to all indications, a regime of decline, signalising the eclipse of civilisation. An analogous result might occur in the event that the proletariat of advanced Capitalist countries, having conquered power, should prove incapable of holding it and surrender it, as in the USSR, to a privileged bureaucracy. Then we would be compelled to acknowledge that the reason for the bureaucratic relapse is rooted not in the backwardness of the country and not in the imperialist environment but in the congenital incapacity of the proletariat to become a ruling class. Then it would be necessary in retrospect to establish that in its fundamental traits the present USSR was the precursor of a new exploiting regime on an international scale. We have diverged very far from the terminological controversy over the nomenclature of the Soviet state. But let our critics not protest: only by taking the necessary historical perspective can one provide himself with a correct judgement upon such a question as the replacement of one social regime by another. The historical alternative, carried to the end, is as follows: either the Stalin regime is an abhorrent relapse in the process of transforming bourgeois society into a socialist society, or the Stalin regime is the first stage of a new exploiting society. If the second prognosis proves to be correct, then of course, the bureaucracy will become a new exploiting class. However onerous the second perspective may be, if the world proletariat should actually prove incapable of fulfilling the mission placed upon it by the course of development, nothing else would remain except only to recognise that the socialist programme, based on the internal contractions of capitalist society, ended as a Utopia. In the decades that passed since these words were written Stalin’s Russia fought the bloodiest war in human history and emerged victorious. 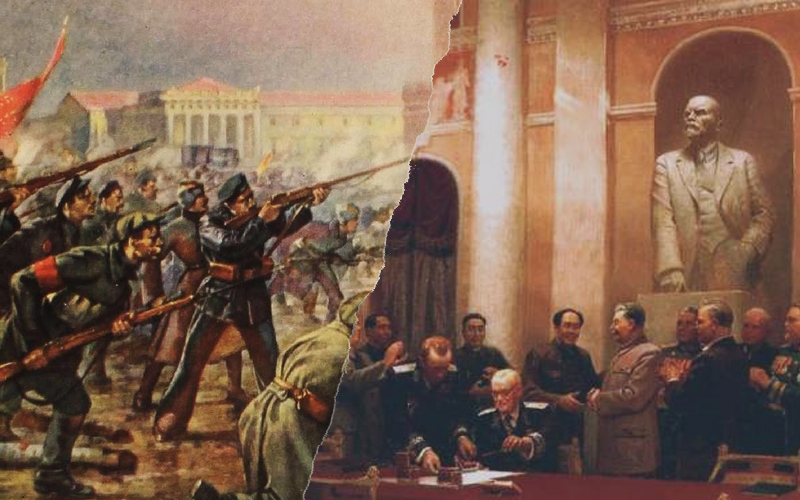 The society created by Stalin proved viable and the political bureaucracy ruling it emerged entrenched in its dominant role beyond its own expectations. Moreover, the same type of regime spread to Eastern Europe, and later – to China. Trotsky’s wondering as to whether the bureaucracy was an “episodic relapse” or “a precursor of a new exploiting regime on an international scale” received an unambiguous answer by the development of history over the last thirty years. The rule of the bureaucracy is a viable historical phenomenon in its own right. The bureaucracy can develop and manage a modern industrial society and become a world power in the political, economic, and military sense. Once the bureaucracy is recognised as a viable historical entity it must be treated as such, that is: its own history must be treated not as some accidental diversion from the mainstream of human history, but as a major feature. What is the life cycle of this new ruling caste? Where was this bureaucracy before it established itself in a dominant role? What is the embryonic, pre-revolutionary, phase of the bureaucracy like? What is the self-image of the bureaucracy? How does the bureaucracy legitimise its role to its followers before it becomes a ruling caste? How does the bureaucracy reproduce, and legitimise, its role to new generations? History is not a magician’s hat out of which ruling castes and new societies are conjured by snapping dingers. The Bourgeoisie emerged and developed long before the Bourgeois revolution established it as a dominant class, Christians were crucified for centuries before the Church became the most powerful institution in Europe. Doesn’t the bureaucracy exist before it takes over power? The standard answer to these questions, accepted by most Marxists, locates the origin of the bureaucracy in the backwardness of Russia and its isolation by hostile imperialist regimes. These specific circumstances no doubt created conditions favourable to the ascendance of the Bureaucracy, but in history, as in crime, it is not the circumstances but the motivations that account for the act. The motivations of the Bureaucracy in its pre-revolutionary phase must not be judged by its post-revolutionary face. The revolutionary bureaucrat is not a power-hungry political careerist, seeking to further his own interests, nor is he an adventurer seeking “a place in history”. Lenin and his followers were willing to pay with their lives and careers for their convictions – and many of them did so. Most of them could choose a different life and gain success in Bourgeois society – some did. Those who chose to remain revolutionaries were amongst the most intelligent and sensitive in their generation. They had the courage to face external perils as well as inner doubts and temptations. Many despaired after the failure of the 1905 revolution, others succumbed to the pressures of “normal” family life. Those who remained were neither organisational fanatics nor theoretical doctrinaires which today, alas, swell the ranks of most Marxist organisations. Their motives were totally unselfish, they were appalled by the suffering of workers and peasants in Bourgeois society and were determined to bring about a fundamental change in society so as to put an end to this suffering. Lenin did not rule by personal authority of by disciplinary regulations. He was often outvoted in his party and never advocated expulsions. It is doubtful whether a sincere and sympathetic investigation, from a revolutionary viewpoint, will reveal any overt flaw in the personality or motives of most pre-revolutionary Bolsheviks, including Stalin and associates like Molotov. And yet it was this party which carried within itself the potentialities of developing into a regime which inflicted unprecedented cruelties upon those whose suffering it sought to alleviate, and unprecedented humiliations upon its own disciples. It is often argued that Lenin’s organisational concept of “Democratic Centralism” is the root of the bureaucratisation. Clearly, this organisational structure enables those at the centre to dominate the entire organisation indefinitely. However, even if “only a dozen heads at the centre do the leading” it is up to them to decide how to use the organisational apparatus which is at their disposal. Why choose to abolish the National Congress of Workers’ Councils? Why choose persistently to oppose shop-floor management in industry? The organisational structure cannot account for the nature of the political decision. A penetrating analysis of the Russian revolution reveals that Lenin had to choose between a policy of “All power to the workers’ councils” and one of “All power to the revolutionary party”. As long as the party has a majority within the workers’ councils this painful choice was not apparent, but how was a revolutionary to choose if the two came into conflict? The answer in know to every Marxist: only those aware of the historical, rather than the immediate, interests of the working class, can take the right decisions. It is therefore their duty to put their understanding of history into action. The revolutionary bureaucrat’s self-image is that of “a specialist in the science of History”. Could it be that the potentiality of bureaucratisation in the socialist revolutionary movement resides not only in Lenin’s concept of Democratic Centralism, but in Marx’s concept of the dynamics of history? All revolutionaries share the conviction that he existing social evils cannot be cured by reforms, but only by changes in the foundations of the social structure. This shared view often blinds them to the fundamental differences within their own ranks. In all past revolutions one section of the revolutionary camp established itself as a new dominant class revealing horrifying potentialities to their former comrades. The Levellers, Danton, Bukharin, and Trotsky suffered worse than eventual assassination by their former comrades, they suffered the belated realisation that they helped create regimes they abhorred. Is this the inevitable fate of most successful revolutionaries? Even if the answer is yes it would not deter many from joining the revolutionary camp. Those who do so in full awareness of this terrible possibility will have only themselves to blame if they play down the fundamental differences between the various revolutionary ideas and organisations. Social revolution is, possibly, the most profound act of creation; its products are not creations outside our selves, but new patterns of selves. We do not know if it pays to be careful with that mysterious process called History, but we know what one pays for being uncareful. We do not know if it pays to be careful with that mysterious process called History, but we know what one pays for being uncareful. I'm surprised this was published by a libcom group (and surprised it is on libcom). Apart from such howlers attributing the creation of secret police to Stalin (as oppose to Lenin), it generally reads as a Trotskyist apologetic with Luxemburg crowbarred in for council communist credentials. They must have snuck this past the editors. I haven't read it yet, however we host everything we can which was written by Solidarity, and this is from their journal which we host, Solidarity for Workers Power. Yes I'm not sure why RobynK has chosen to post these extracts from the old Solidarity UK journal separately on libcom. There are certainly some criticisms that could be made of this article in terms of Solidarity, and Castoriadis more specifically, views on the nature of modern bureaucracy as a general tendency within global capitalism commonly held by others at that time, but I don't think the spgb's jondwhite would be best placed to make that based on his irritated response to what is anyway a pretty thin article. Yes I'm not sure why RobynK has chosen to post these extracts from the old Solidarity UK journal separately on libcom. FWIW, without passing judgement on the articles themselves, I find having individual articles in text format way more convenient than just having the pdfs of whole issues alone, so thanks to Robyn for posting them. I thought it was generally considered helpful to have articles transcribed and posted separately so they aren't hidden away in PDFs. Even if I don't always agree with the pieces I transcribe, I think it's good to have them more easily accessible for people to read, discuss, and debate. If the admins want, though, I can stop transcribing articles I stumble upon in PDFs, or just transcribe articles they agree are more in need of being pulled out of PDFs. People only usually read PDFs out of desperation, transcribing is great. It might be worth a forum thread to try to co-ordinate transcriptions but for me personally I don't think it matters if 'bad' articles get transcribed - eventually we could end up with the entire Solidarity back catalogue in HTML which would not be a bad thing regardless of the order it happens. This article does read as essentially Trotskyist, but didn't some Solidarity/Subversion people have crossover with the pre-SWP ISJ? (I vaguely remember someone mentioning it on another thread but can't remember the details). A lot of people around that milieu, especially the Facing Reality group but also Ngo Van Xuyet with SouB were breaking/had broken with Trotskyism, so it would not surprise me if someone got involved who had not quite broken with it. Also with CLR James specifically, there was some elasticity between breaking with Leninism as a current practice, and breaking with Lenin as a historical figure/theorist. Yeah, the only reason we have any PDFs here is because it takes time to transcribe them, so we are extremely grateful to Robyn for her assistance in this regard. I read this as mildly critical of Trotsky. It’s worth remembering that in 1974 there were still some trots who would argue that the Second World War was not over, as there had been no world revolution as predicted by their prophet. It is a ‘bit thin’ though Solidarity had a mixed working class readership and many would never have read the usual turgid stuff (dense text and no illustrations) often served up as serious Marxist theory. Fair enough to both responses. Sorry to sound pointed. Please don'rt get the UK Solidarity and Subversion groups or membership mixed up as there is plenty recounting the relationships that existed between the Solidarity (for Social Revolution), Social Revolution, Wildcat and Subversion groups on this site. None other than some of the early Solidarity London people were ever in a Trotskyist group.